What is denial? 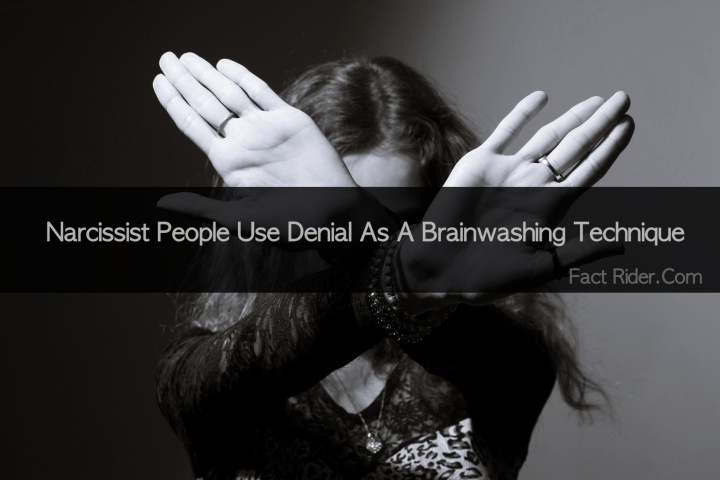 More importantly, what is Denial — the psychological term for openly denying have done, thought, or said something to another human being (especially in such a way that it provokes a triggering response from a target). To bait or provoke then wait for a response is considered antagonistic; it’s a truly offensive move (pun intended) on the football field of life, aggressively initiating an attack on a rival before they have even been informed that they are expected to participate in game playing the abusive personality already — while striving to dominate while attention-seeking — already started. Narcissistic people who are Covert Narcissists by nature are those the most likely to have first used denial as a way to avoid taking personal responsibility for things, but Sociopathic predators are likely to have figured out how effective of a tool it can be to use as brainwashing technique. People who listen to predators end up being prey. Victims of a Narcissist’s ploy to gaslight them into believing whatever they do or say is true often experience the worst of late-in-life wake-up calls. Whether a parent tells you they stayed in an abusive marriage for the sake of the children or they deny moral culpability for inciting rage and feelings of emotional insecurity in a cheated-on spouse, the more narcissistic the person in general then more likely they are to pull the denial of accountability card. Narcissistic predators have impulse control issues, period. They blurt out angry, irrelevant, ridiculously hurtful and demeaning things to their scapegoat targets all the time. The ultimate situational abusers, they can be frothing at the mouth insulting a perceived rival one minute (assailing them with the most antagonistic and cruel-natured verbal attacks) then the next minute will deny having done or said anything either inappropriate, unethical, or outright false and/or factually incorrect. I really don’t know where you/she/he/they come up with this stuff. You/he/she/they are just making stories up, now. You/He/She/They are just so angry all the time… I don’t know WHY they feel that way. I was only looking out for you. I swear you are losing it. Do you need me to take you to a psychiatric hospital? I think you are hearing things again. I never said that… well, I did say it — but it’s not what I meant! The more malignant the personality, the more likely they are to tell a victim something to their face then deny that same statement in public or private later. The more anti-social the predator, the more they will strive to pull off such denial charades with some level of boredom-relieving flair. Expect men and women who are masters of the art of denial to say one thing then do another. Count on if their lips are moving, they are probably lying. Denial is something that should be ethical by nature. If someone has no knowledge of something or deny’s being involved with something (or someone), their answer should be true and factually accurate. A person who cheats actively and openly on a serial basis then gaslights their spouse, friends, and family members into believing they are somehow the victim lies not only his friends and family. They lie to and about their spouse, their paramour or mistress, and reveal nothing but deep, dark, convoluted and wicked truths about themselves. Denial used to confuse and frustrate a scapegoat or preferred target in the hopes they will lose either their sanity, reputation, or be effectively brainwashed into doubting themselves or losing their cool? Bottom line, to do so — even for a narcissistic predator — is playing dirty pool. It’s a covert narcissist’s go to move for a handy-dandy brainwashing trick. If a victim buys a liar’s false claim and gives he, she, or them credit for having a valid opinion based on their assertions, then the con is complete. A Narcissist only wins when they have a perception they have duped someone, conned, or made a selfish gain at someone else’s expense. Denial, then, is simply a weak (meaning cowardly) Narcissist’s covert abuse tactic. That, or it’s the psychological refuge, conversationally speaking, of a truly deviant and malevolent person. It’s like they live their life thinking they are in a true crime drama. Magically, Narcissists and Sociopathic predators alike seem to think that by looking a victim in the eye and denying having said or done anything malicious to them in private, the moral conversation will go down in cosmic history as “off the record”. Last we checked any of the reference checks, the Bible, Koran, Hindu religious texts, and Confucian Analects all say the world and all-seeing entities like gods or an omniscient being don’t work like that. Don’t be brainwashed by someone gaslighting. Gaslighting is covert Narcissistic Abuse at it’s finest. This article has been republished from Flying Monkeys.com, click here to view the original copy.